In early September, the studio at Caveworks Press became pleasantly busy as not one, but three people worked together to create something new. Aaron McNally’s press, Q & DP, which has been producing chapbooks as a “Micro-Press dedicated to publishing original poetry in the Cedar Valley,” rolled into printing the covers letterpress. That is a pun intended. See pictures below. Last fall, Aaron had come over to try his hand at printing a bookmark, and we enjoyed the exchange of learning and conversation about poetry as we worked. I think it also gave Aaron a first-hand impression (pun intended again) of the work that into printing his book that we published in 2008. Aaron wrote a blog post on the North American Review’s page about the experience, in fact. It was at the North American Review where we met, as volunteer editorial assistants. But today, Hannah Carr-Murphy was the poet we were celebrating, and she too tried her hand at typesetting and printing. She set her name admirably, picking up the technique with aplomb. And printed. It gives me great joy to share the craft of letterpress with such appreciative lovers of the word; To handle the concrete form of words, to build with them. 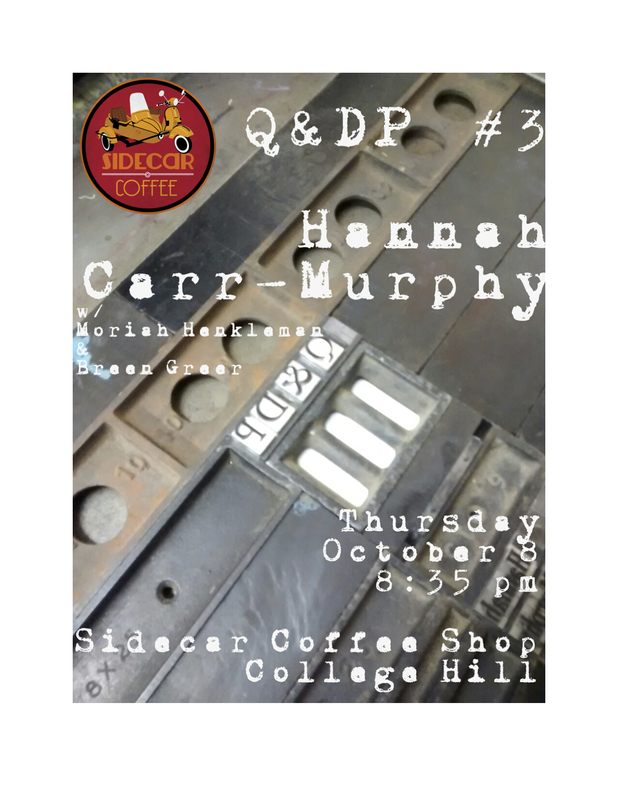 To celebrate the release of Q & DP #3, a reading will be held at Sidecar Coffeeshop on College St. Cedar Falls. The reading will take place at 8:35 pm on October 8th. Find Q & DP on Facebook here. Other featured readers include Mo Henkelman and poet/guitarist Breen Greer. Caveworks Press will also have a table with our literary offerings, including Aaron’s work.